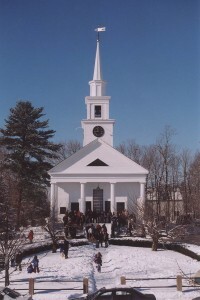 The First Parish in Sharon was gathered in 1737, as the Second Parish in Stoughton. (Sharon was not yet a separate town.) It called its first minister in 1741, the Rev. Philip Curtis, a young minister fresh from Harvard who went on to serve as a beloved leader of the congregation for 50 years. 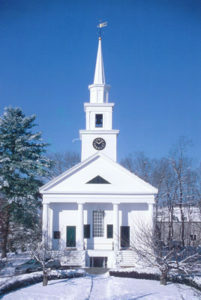 The early history of the Sharon church is similar to that of many New England ‘first parishes.’ The first meeting house on the present site was built in 1787, on a “meeting house spot of land” on the town’s central green given by Rev. Curtis. During the ministry of his successor, the Rev. Jonathan Whitaker, religious divisions led the Baptists to break away in 1813 and the Christian Society (orthodox Congregationalists) in 1821. The Unitarians of Sharon were part of a broader movement toward a more liberal theological understanding that arose in the first half of the 19th century. The American Unitarian Association was formally established by a group of New England congregations in 1825; it both influenced and was influenced by the Transcendentalist movement of Ralph Waldo Emerson (who began his career as a Unitarian minister), Henry David Thoreau, Dr. William Ellery Channing and others that helped to shape American philosophy and values in the 19th century. The Unitarians saw themselves as liberal Christians, following the Biblical teachings of Jesus but affirming the oneness of God, questioning the doctrine of the Trinity (hence “Unitarian” versus the Congregationalist “Trinitarian”), and asking adherence to conscience and insight over required profession of a specific creed. Old records preserved in the church’s archives tell of numerous ups and downs in its two centuries of Unitarian identity. With a treasured old building and no endowment, money was often tight, but the church was resilient, and remained a local beacon of liberal religion, active and often engaged in issues of social justice. It spoke out for the abolition of slavery. It ordained and called a woman minister in the 1890’s, a rare action at that time, and women have consistently played a strong role in the congregation. It sent its minister to Selma in 1965. It hosted the newly formed congregation of Temple Sinai, and has been a home for a number of interfaith events over the years. It has long supported causes beyond its walls and been engaged in the world. In 1954, the congregation formally changed its name from the First Parish in Sharon, Unitarian, to the Unitarian Church of Sharon. In 1960, facing a shortage of space, the congregation’s members pitched in their time, talents and money to add a religious education wing to the original meeting house, building it primarily with their own labor. 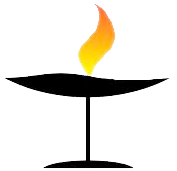 In 1961, the congregation voted in favor of the merger of the American Unitarian Association and the Universalist Church of America to become the Unitarian Universalist Association, and was enriched by the addition of the Universalist heritage to its own, becoming a Unitarian Universalist congregation. Over the years, its theological understanding and liturgical practice broadened beyond a predominantly Christian focus to embrace the insights of other religions and of religious humanism. 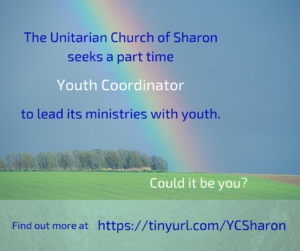 Like many congregations, the Unitarian Church of Sharon hit one of its lower points in membership in the 1970’s, but there was always an active core and a commitment to maintain a liberal religious witness in the community. Ending a shared ministry with the Foxboro Universalist Church in 1978, the congregation used a four-year period of lay leadership to reflect and rebuild, returning to part-time ministry in 1982. The congregation faced a series of challenges related to the building in the 1980’s—a tottering steeple, a bell not safe to ring, a foundation eaten out by termites. It raised funds creatively, including establishing a Meetinghouse Preservation Fund and turning the meetinghouse into the hall of the Continental Congress for two runs of the play “1776”. The congregation met all its challenges with good spirit, cared for and improved the building, and grew in activities and numbers, adding a part-time staff of minister, religious education director and administrator. Recognizing that the growth and depth they desired were hindered by their inability to afford a full-time minister, they applied to the Unitarian Universalist Association’s Extension Ministry program, which helped with the initial costs of a move to full time ministry. The Rev. Deborah Cayer served as minister from 1995 to 2008, the first full-time minister since the 1960’s, as the congregation grew in spiritual depth and outreach as well as numbers. Recent years have brought great changes to the congregation. The Religious Education program has thrived, with increased professional leadership and the addition of a part-time Youth Coordinator to the staff. A Memorial Garden was added to the grounds. The congregation was committed to universal access as part of its mission, and began working on increasing accessibility to and within its historic building. With growth in numbers, it also faced crowding, especially in its burgeoning religious education program. 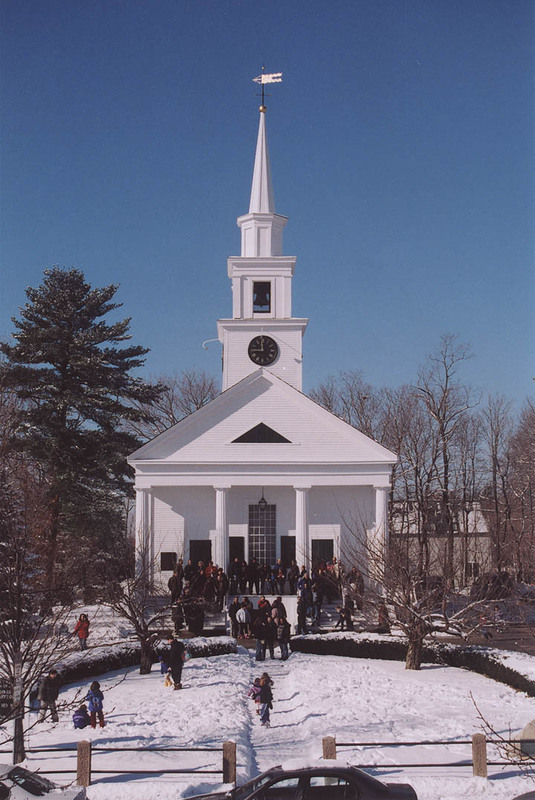 In 2007, it launched plans and a capital campaign to add significant space to the meetinghouse and provide universal access to all parts of the building. Interim Minister Tricia Brennan, serving from 2008 to 2010, helped sustain the congregation through the demolition of the 1960 religious education wing and the construction of a spacious, environmentally sustainable new two-story addition. It was an ambitious project, calling for the generosity and labor of many members. It stands as a model of responsible and thoughtful construction, blending architecturally with the original meeting house, providing both excellent meeting space and full accessibility. The new building was dedicated in May 2010, with great celebration. The Rev. Jim Robinson was called as minister and began serving in the summer of 2010. As one member commented, “We are the little church that could”—a vital congregation that carries its long history forward into the future with generous and positive spirit. played for the piano prelude. fluttering outside in a sharp March wind. stamped before Douglas debated Lincoln. link together in wooden pegs. peers in mid-beam, holding and fastening nothing. torn down over doctrinal dispute. move hands to tell time in three directions. while the hands turn through the hours and minutes. Tolled to bring us here to share our own histories.